Craving a pizza right now? no problem! 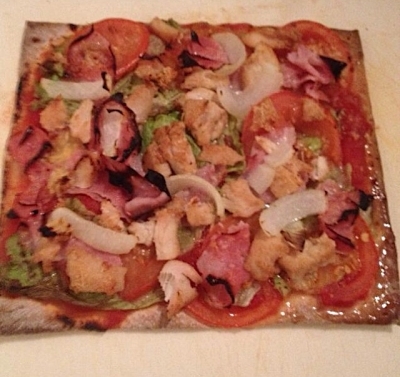 here is a super healthy pizza which will leave your mouth watering for more!! Method: pour the chopped tomatoes onto the flat bread to use as your pizza sauce base. Add lettuce (iceberg,wild rocket or even spinach) to your pizza base. chop up tomatoes and add onto lettuce,add your pre cooked chicken, low fat ham, and diced onions on to the pizza. to finish off add a little sprinkle of parmsan cheese on top. place into oven on 180 Degrees for 12-15 minutes or until flatbread becomes crisp like.